For those who read my series on the origin of my v-neck aran sweater saga, I can happily report that I am *finally* done! For those who missed the series, you can begin reading the story here. DH and I had a weekend away, which was the perfect time to leave pieces of wet wool drying on pillows on the floor all over my house. No risk of children landing on pins, or adults spilling coffee as they trip over the pillows. I had been a little intimidated about having to block the wool into the right sizes (they would have to grow 4" in width), and it turned out to be easy--no pins needed at all. In fact, they would have stretched 6-8 inches further if I had wanted. OK, pieces blocked, ready for sewing together, and DH agreed to be my brother's stand-in. It came out GORGEOUS! 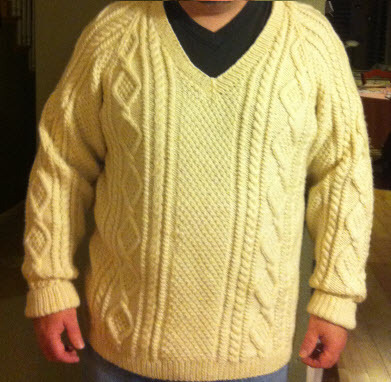 The finished sweater is heavy--over 2 pounds of warm wool! That should keep my brother warm. Final tally on the materials for this sweater, adding in $38 for overnight delivery? 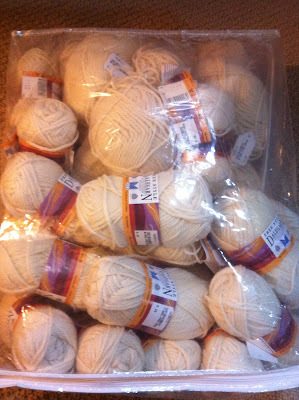 : Cost of wool, patterns, books, more wool, shipping for all including the final sweater: $408. Keeping my brother warm through the snowstorm coming this weekend? Priceless. Priceless is the right word. Your work is beautiful! The sweater is priceless!! But then, the years of mentoring and advice you received would be worth twice the price. Now about the watch cap? And about the "repo" visit come on but be warned it would take a loong time to find it. At least a week. Can't wait to see how your husband's sweater turns out. Your brother's is amazing.